Cheng Ho is a Chinese admiral who commands expeditions to Southeast Asia, South Asia, and East Africa. Precisely during the 15th century. In 1416, he stops at north Java, in a city nowadays known as Semarang. Sam Poo Kong Temple built to commemorate his arrival. 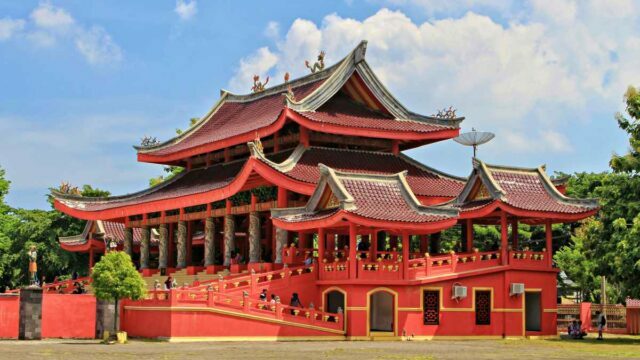 The temple’s architecture adopts elements from Chinese, Javanese, and Islamic culture. Centuries later, the temple is not only the legacy the admiral left behind. He also left another thing: a harmonious community of different cultures. After Cheng Ho left the island, some of his crews remained. The crews never left Semarang, adapt to local customs, and married local women. Their descendants maintain both Chinese and local culture alive. The mixture of cultures nowadays still here and exist through centuries. Although Cheng Ho himself is a Muslim. Sam Poo Kong is a temple of Tridharma (Taoism, Buddhism, and Confucianism). Pilgrims coming to this temple aren’t limited to Tridharma only. Some Muslim, particularly a traditional branch of Islam called Islam Kejawen, also go to this temple regularly to pray and seek blessing. Learn how different cultures can blend beautifully by examining Sam Poo Kong architecture and design. Chinese, Javanese, and Islamic cultures form one architectural masterpiece. It also goes more than that. Sam Poo Kong is also a representation of a centuries-long peaceful cohabitation. Between the three different cultures in Semarang community. The temple takes a Javanese Joglo form. A non-walled square room design usually supports by four or more pillars. The Chinese influence is so obvious. With the dragons and hong birds ornament. Sam Poo Kong itself faces northwest. Toward the direction of Mecca, like an Islamic mosque. Walk around the temple and get drown in the color of red. The Chinese color of good luck. There are five temples in Sam Poo Kong Temple. The main temple and also the oldest one is Sam Poo Kong. The other four are Kyai Juru Mudi Temple, Kyai Jangkar Temple. And the other Kyai Cundrik Bumi, and Mbah Kyai Tumpeng Temple. Notice how their names are Javanese names rather than Chinese. The culture blend apparently doesn’t stop at its architecture only. Learn more about Admiral Cheng Ho expedition on stone murals. Carve at the temple’s wall. The relief was just added during the renovation in 2005. There are ten parts to learn from. With each depicting a chapter of the admiral’s adventure in Indonesia. At the bottom of the reliefs, there are inscriptions. Written in 3 languages: English, Chinese and Indonesian language. Take an inspiration on how his voyage is nothing but a peaceful trade mission. Cheng Ho’s voyage was not about conquering new land or expanding power. It is about seeking friendship and culture exchange. Learn about one of his crew that never left, Ong Keng Hong. His interesting story, the explorer who then become a respected member of society. During the 15th century in Semarang. Ong Keng Hong plays a big part in society. Mainly in introducing Chinese culture to Javanese society at that time. At only IDR 80,000, visitors can rent beautiful Chinese traditional clothes. The Chinese costumes come in colorful colors with floral or dragon patterns. Pose around the temple feeling like a Chinese royalty. The rent comes with a photographer too. Which is convenient without having to take own selfie. A tip, pick the ultimate costume: the Cheng Ho costume. It is a replica of what the admiral wears on his statue in front of the temple. Sam Poo Kong Temple host many festival and ceremonies throughout the year. Cheng Ho Festival, held between June to August each year. Is the anniversary of Cheng Ho’s arrival in Semarang. Come during this time to see statues of Cheng Ho. And his crews Ong Keng Hong, Lauw In, and Thio Ke, parade around the city. Apart from the parade, there will be art performances, games, and cultural talk-shows. Chinese New Year is another joyful celebration. Enjoy the lion dance performance “Barongsai” during the new lunar year festival here. Sam Poo Kong festivals are often multicultural and cross-religion. They also host festival during Muslim Holiday “Eid al Fitr”. With art performances from both Chinese and Indonesian culture, as well as a culinary bazaar. Sam Poo Kong Temple opens every day, all year round, from 8 AM to 8 PM. The square area can be very hot at noon so it’s best to go early in the morning or late in the afternoon. See: Lawang Sewu Building & Museum, Landmark & Dark History. There are two kinds of tickets. For square-only ticket, it costs IDR 10,000. A whole visit to both square area and worship area require a ticket which costs IDR 30,000. See: A Guide To Explore Dieng Plateau, Temple, Lake & Other Activities. Sam Poo Kong provides a wide parking area for visitors. Basic facilities include toilets, information area, a nursery room, and disability access. Visitors don’t have to worry about finding food and drinks because there’s a food court inside the temple premises. There is also an area to do some souvenir shopping. Sam Poo Kong Temple is situated at Simongan Road No.129, Bongsari, West Semarang. Its location is in the city center and only 8 km from Ahmad Yani International Airport. To get there, visitors can use a taxi, a rented car, or a rented bus. Visitors coming from Tawang Railway Station can use bus service Trans Semarang route K2, the fare is only IDR 3,500/trip.